A brand new Kayak, The Mark II is a fast stable boat. Many people from 5 years old to 85 years old have paddled the Mark II and loved it. Mark II is a fun and very fast boat. An easy first time boat to build and paddle. 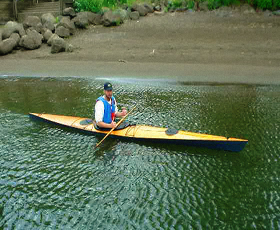 Mark II is the best Kayak that the Boat Designer Jerry Estes has ever designed.